Gossip. Power struggles. Poor team coordination. These are all symptoms of workplace drama. They're the obstacles that can drain your company of its best talent, get in the way of true productivity and profit, and eat away at the effectiveness of your organization. 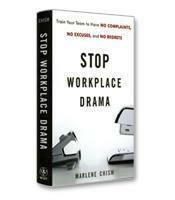 In Stop Workplace Drama, Marlene Chism shows how to change the way you and your organization confront and work through problems, implement effective management strategies in a drama-filled organization, and find new solutions that create positive growth for every member of your company. How to create healthy boundaries, get your work needs met and make the most of your valuable time. How to seek viable opportunities and take responsibility for your efforts. How to instill necessary changes without unleashing fear in your organization. How to cut through your personal drama so that it doesn't create further issues at work. How to boost morale, maximize your company's potential and put your organization on the road to success.